Sciblogs | How does agriculture affect New Zealand’s water quality? How does agriculture affect New Zealand’s water quality? About 40% of the land area of New Zealand is in some form of agriculture. Sheep and beef farming are the most extensive (33%) followed by dairy farming at 6%, and the remainder being horticulture and cropping. Based on a large number of comparative land use studies we have a good understanding of how agriculture affects water quality and know that about 97% of the nutrient loads entering our freshwaters are from diffuse sources, in contrast with point-sources such as pipes and wastewater discharges. Pastoral land use contributes three principal pollutant types: the nutrients nitrogen (N) and phosphorus (P), sediment, and faecal microbes. 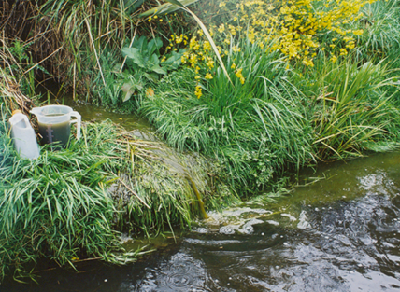 Nutrient enrichment of waterways can lead to unwanted growth of plants (waterweeds and algae). Excess sediment may cause siltation, impair oxygen transfer processes and degrading water clarity. Faecal matter and its associated pathogens presents a risk to human and animal health through waterborne infectious diseases. The extent of this risk is assessed by measuring water concentrations of the benign indicator organism, Escherichia coli (E. coli). The cumulative effects of more than one of these contaminant may be greater than the sum of their individual parts. 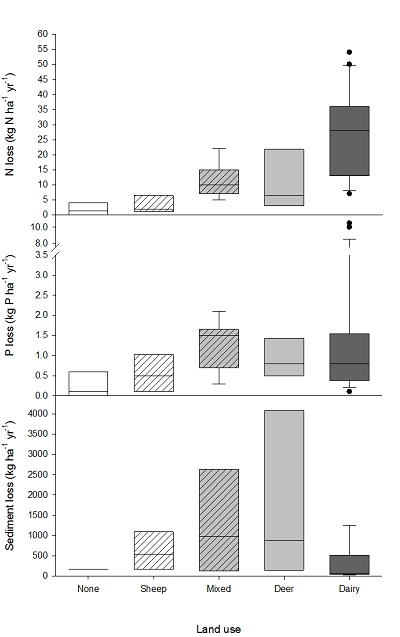 For example, elevated levels of N and P may stimulate vigorous plant growth that results in high pH levels during late afternoon and thereby exacerbate the toxicity of ammonia to fish and aquatic insects. Inputs from specific land uses to waterways are characterised by their ‘yields’, which are the loads of pollutant per unit area per year. Significant differences occur in the amounts of contaminant delivered to surface waters, according to slope and elevation of land. Nitrogen enters surface waters via leaching to groundwater, whereas sediment, faecal matter and P enter streams mostly in surface runoff. Hill-country farms have lower stocking rates than flatland farms, but greater runoff potential because of the steeper landforms. This affects sediment, P and faecal microbes in particular. In contrast, N losses are highest on flatter lands, where the highest stocking rates are. The major source of E. coli in most farming systems is via overland flow from ruminant faeces and this is likely to be greatest on steeper land, although this is not the case where large herds of cattle are allowed direct access to waterways. Box plots showing the median concentration, bounded by the 25th and 75th percentiles, the 10th and 90th percentiles as whiskers, and outliers as dots, for N, P and sediment annual loads for each stock class of land use. ‘None’ refers to non-agricultural rural land uses, such as exotic plantation and native forest, while ‘mixed’ refers to a catchment with more than one stock land use class (McDowell & Wilcock 2008). A comparative study of different sorts of pastoral farming found that dairy farms on flat land at low elevations lost the most N, but very little sediment, although it was not statistically different from forest, sheep and mixed land uses. Deer farming tends to be on rolling land at a significantly greater elevation than dairy, but not other land uses. Deer farms lost significantly more sediment than any other farming type but had similar losses of N, except for dairy farming. The remaining land uses (sheep and mixed), were in lands with similar slope, elevation, and sediment and N loss. However, it should be noted that loads reported from non-agricultural land uses demonstrated the least loss of N, P, sediment or E. coli. Estimates have been made using the SPARROW (SPAtially Referenced Regressions On Watershed attributes) model to estimate their relative contributions of nitrogen (N) and phosphorus (P) to freshwaters and to the coasts of New Zealand. Dairying and sheep+beef farming each contribute 30-40% of N entering freshwaters and the coast, with forests contributing most of the remainder. About 50% of P entering freshwaters and the coast is in sediment, about 20% from sheep+beef farming and 10% from dairying. 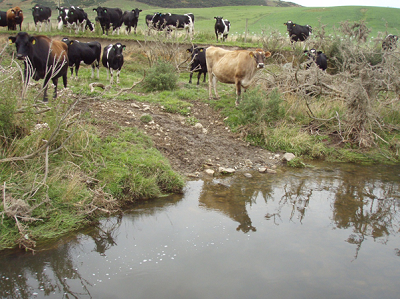 A broad suite of mitigation measures is available to farmers and offers some hope that increased production need not be accompanied by water quality degradation, so long as they are widely adopted (PDF; Waikato Regional Council’s ‘menus of practices’).